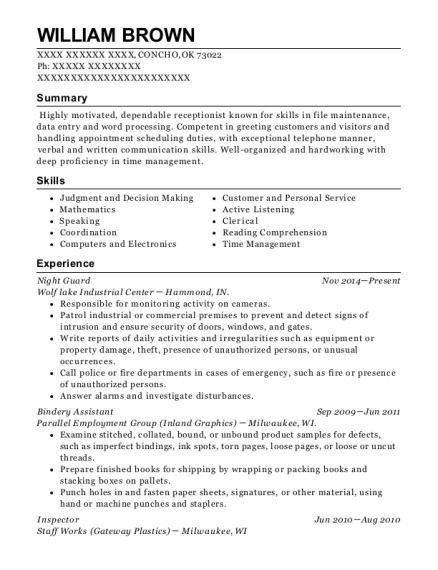 Highly motivated, dependable receptionist known for skills in file maintenance, data entry and word processing. Competent in greeting customers and visitors and handling appointment scheduling duties, with exceptional telephone manner, verbal and written communication skills. Well-organized and hardworking with deep proficiency in time management. Night Guard Nov 2014－Present Wolf lake Industrial Center － Hammond, IN. Responsible for monitoring activity on cameras. Bindery Assistant Sep 2009－Jun 2011 Parallel Employment Group (Inland Graphics) － Milwaukee, WI. Inspected buckets, handles, and lids to ensure these were molded with precision. Placed finish products on skid to be shrink wrapped according to work order. Produce reports regarding nonconformance of products or processes, daily production quality, root cause analysis, or quality trends. Injection Mold Operator/ Inspector Jun 2005－Feb 2007 Smith Medical － Gary, IN. Visually inspected silicone medical supplies which were being molded for contamination, shorts, burns, etc. Maintained cycles were after each other to prevent mold from cooling and maintain quality runs to increase production. Accurately record all cycles for production records. Receptionist / Clerical Assistant Jun 2004－Jun 2005 American Family Insurance － Calumet City, IL. 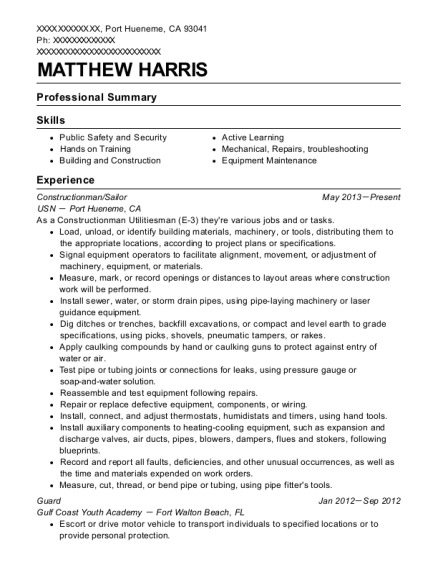 This is a resume for a Night Guard in CONCHO, Oklahoma with experience working for such companies as Wolf lake Industrial Center and Parallel Employment Group Inland Graphics. 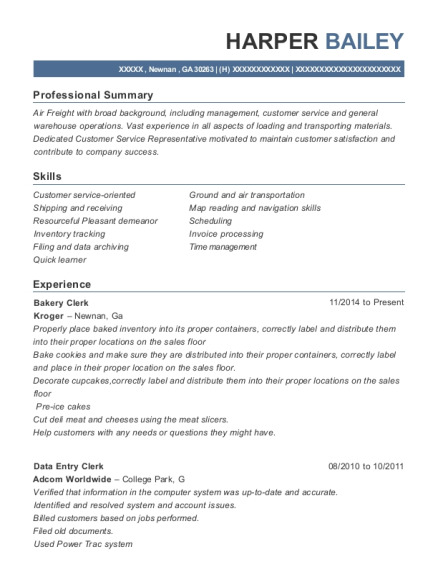 The grade for this resume is 0 and is one of hundreds of Night Guard resumes available on our site for free. 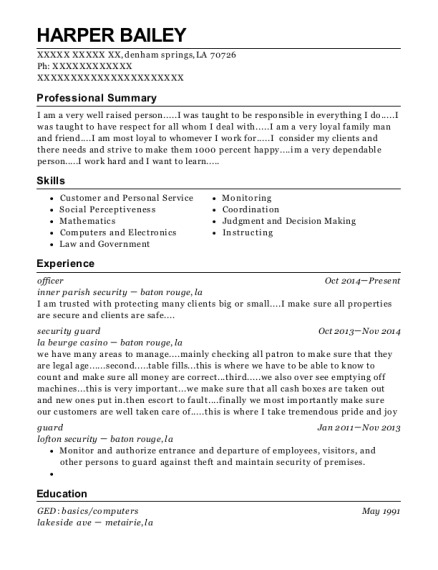 Use these resumes as templates to get help creating the best Night Guard resume.